Yesterday, my wife asked me where the comic "Chinese bride" was. I gave a reply to her "I don't know the book at all." She seemed to be confused "Koumei's bride" with "Chinese bride". This book showed some difference of nation cultures, concepts, and belief from the viewpoint of a marriage, on which we cannot ignore the the differences. I think that this book is not only pleased but gives us the significance of internationalization. As far as I am concerned, I have been lucky to have chances to meet many non-Japanese persons. I cannot remember how many times I had gotten mad with them. In my case, I had gotten angry, wept and thrown up for the differences of deadlines and percentage completion of papers. And maybe, they had also had inflamed with rage for my behaviors, "Ebata couldn't show the final decisions, and he had no intentions for his missions". In fact, they told me the above face to face. It is terrible difficult to make the companies decisions for many Japanese big companies, and more and more period of time are needed. If we ignore the above complex procedures, any work is going to stop absolutely. And many non-Japanese person could not understand the Japanese culture background, so I cannot help be helped. They are unintelligent not to understand systems of Japanese organization. In order to change the direction of mega-battle ship, we need rigid preparations and specified period of the time. However, it is true that many companies in Japan have lost a lot of business changes. I feel happier than reading papers of ignorance critics. Firstly, I traced routes of transportation from the home to an examination school with a highlighter. After I decided a main route temporally, I tried to simulate some accidents resulting in injury or death, on the map. I discarded the case of more than two accident simultaneously because of the low probability. I could not make a strategy. The problem was a time lag from the accident to giving me the precise information. If I missed an initial action, I could not expect the arrival on time by the alternative route. However, empirically, I know that railroad companies cannot give us a precise report just after the accident, and they cannot open an alternative route immediately. Though Twitter is good as a real-time information resource, it was not useful in this case because of the time of early morning. Youngers didn't use the smartphone in that time. "No use. It is difficult for me to judge the whole situation, riding on trains"
I thought that I had to grape the whole situation from the outside as a third person. In addition, even if I could observe the situation from the outside, I had to use a car in order to escape from the accident. Generally speaking, the answer was using a taxi. But many examiner and the guardians came to pour to taxi stop. To begin with, the case became to worse, because I could not predict the time of both the departure and arrival. "How about my private car?" Secondly, I traced routes of main roads from the home to the examination school with a highlighter. However, thinking about accidents and traffic jams, it became to be worse than using trains. Because there were no alternative way against the accidents, like flat tire. I was troubled for two days. Finally, I could reach a conclusion, while scowling at the map, opened on a floor. "I will make a dual system"
Time, a person can use, has it limit of 24 hours, so many companies in advertising should struggle against the scrambling. You know, many people are likely to reduce the time of watching TV for smart-phone, and other media agencies try to rob then of their time. One of the agencies is "train". Recently, many trains have liquid crystal display(LCD) as destination screen of the train, and the train company is doing AD by movies (CM, so-called). "We cannot skip the CM like a "hard-disk player""
"It might be possible in near future"
I think that this is an important bigger advantage than other CM. To tell you the truth, I want to talk to you about the Odakyu-Dentestsu's contents. 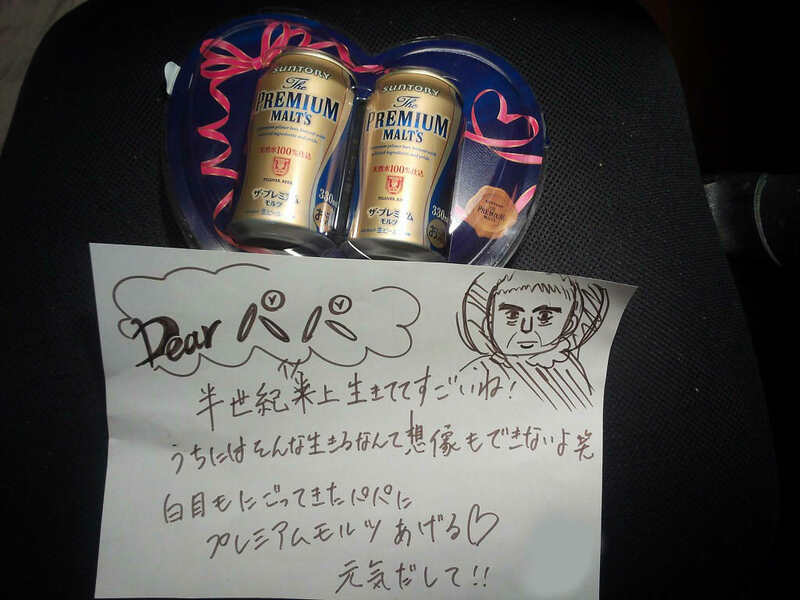 My eldest daughter got me a beer for a present of Valentine's Day. I will get handmade chocolate from the second daughter (although it is a remainder). To young people. Look at me with keen interest. This is a man in "winning group". Last night, I went into a barber of super baths for the first time. It is very helpful for me that it is open until 22:20 at night. I keep myself away from sleeping in a taxi or barber shop. Those who took charge today were women of a large body in their 70s with. "I am not good at personal computers"
In one word, as my weekend writer, I was interested in her, and I was interviewing her implicitly. Ebata: "Is there anything you are in trouble without PC?" Woman: "There is absolutely No, do you have anything in trouble?" Ebata: "It might be convenient, for example, purchase of train tickets, shopping, getting documents to be issued without in the row of government offices. Woman: "Well, that's fine because my husband do all. He is working on electrical work and drawing pictures on my computer". Ebata: "Then, have you had any trouble without e-mail? " Woman: "I'm doing e-mail on my mobile phone, ""short message"？ But, I don't use a smartphone. Ebata: "No, no doubt it is "you are doing" wonderfully. Woman: "I use it only to get in touch with my daughter. My daughter is doing a nursing care now, so I can not call you anytime. "